Dyck, Noel and Tonio Sadik. "Indigenous Political Organization and Activism in Canada". The Canadian Encyclopedia, 17 January 2018, Historica Canada. https://www.thecanadianencyclopedia.ca/en/article/aboriginal-people-political-organization-and-activism. Accessed 19 April 2019. Political activism among Indigenous people in Canada since the late 19th century has largely reflected attempts to organize political associations beyond the band level to pursue common interests. As member for Rupert's Land, Harper stalled the Manitoba legislature past the deadline for approval of the Meech Lake Accord (courtesy Reuter). Premier Harry Strom, Harold Cardinal and Jean Chrétien, Minister of Indian Affairs, 18 December 1970 (courtesy PAA/J-547). Political activism among Aboriginal people in Canada since the late 19th century has largely reflected attempts to organize political associations beyond the band level to pursue common interests. In the wake of persistent criticism of the federal government’s proposed “White Paper” policy (1969), major Aboriginal organizations, most notably the Assembly of First Nations, gained political recognition and became established players on the national scene. These organizations were joined in 2012 by the national movement Idle No More. This article describes Aboriginal political organization as it relates to Canadian federal, provincial or territorial political bodies, not the political structures of specific Aboriginal communities, which often predate interaction with Europeans and subsequent colonial infrastructure. One of the earliest Aboriginal political associations, the Grand General Indian Council of Ontario and Quebec, was the outcome of missionaries' efforts to establish a council of Ojibwa nations prior to Confederation. In existence from the 1870s until 1938, the council pursued a cautious and conciliatory course in its dealings with federal administrators. The Plains Cree, in contrast, in the five years prior to the Northwest Rebellion of 1885, began to form a political alliance to force the federal government to honour its treaty commitments. Though their participation was limited in scope and largely unintended, the rebellion pre-empted a previously scheduled gathering of First Nations' leaders from across the Prairies to decide how best to press for desired changes in federal Aboriginal policy and administration. The rebellion led to a tightening of government control of reserves and further erosion of Aboriginal autonomy. While political organization and activism were severely constrained by the terms of the Indian Act, 1876, and by the fact that Aboriginal peoples were not entitled to vote in federal and provincial elections until 1960, the struggle to realize their various aims continued. In the 1890s, the Nisga’a in British Columbia began their campaign to obtain government recognition of their land rights. In 1906, the chief of the Capilano Band travelled to England to place a land claims petition before King Edward VII. A new organization, the Allied Indian Tribes of British Columbia, was formed in 1916 in an unsuccessful attempt to force the British Privy Council to make a judicial decision on land claims. Following the government's rejection of the Allied Indian Tribes' land claims in 1927, the organization folded, only to be succeeded in 1931 by the Native Brotherhood of British Columbia. This organization arose out of Aboriginal labour-oriented activities in coastal industry and remains a major force that promotes fishing rights and other issues relating to BC’s coastal Aboriginal communities. In 1919, the League of Indians of Canada was formed in Ontario by F.O. Loft, a returning First World War veteran and member of the Six Nations of the Grand River. Loft advocated for the resolution of a set of grievances common to Aboriginal peoples across Canada. Among these concerns were the loss of reserve lands and the failure to recognize Aboriginal land rights, restriction of hunting and trapping rights, culturally destructive educational policies and administrative practices, and poor economic and health conditions on reserves. In the early 1920s, Loft's efforts to bring western Aboriginal peoples into the league were effective despite opposition from senior officials of the Department of Indian Affairs who attempted, among other measures, to revoke his legal Indian status. The league would eventually fail, due to difficulties in uniting geographically separated and ethnically, linguistically, and religiously divided bands into a national Aboriginal organization. The 1930s and 1940s brought an increase in Aboriginal political organization, especially at the regional and provincial levels. The Indian Association of Alberta formed in 1939, the Federation of Saskatchewan Indians formed in 1944, and the North American Indian Brotherhood formed in 1945. The forming of the latter by Andrew Paull, a Squamish leader, was another attempt to establish a national organization of Aboriginal people. It failed, partly because of the suspicion that it was an organization primarily for spreading Catholicism. The emergence of the National Indian Brotherhood (NIB) in 1967 marked the germination of the organization that would largely define the national political landscape for First Nations people. The federal government's 1969 White Paper proposed to abolish the Indian Act and the Department of Indian Affairs and Northern Development (now Indigenous and Northern Affairs Canada), and to transfer administrative responsibility for Aboriginal peoples to provincial governments. This sparked a dramatic increase in the scope and intensity of political organization and activism in Canada. Opposition to the government's proposals led to the creation of several new provincial associations and the transformation of some existing groups into active political organizations. Those organizations began to receive political recognition from governments. Working with luminaries such as Harold Cardinal, the NIB and various regional bodies gained sufficient political momentum to defeat the formal adoption of the White Paper in the early 1970s. Despite this victory, many First Nations leaders believe the intent of the policy paper still exists. The National Indian Brotherhood became the Assembly of First Nations in 1982, now representing 634 member chiefs across Canada. The Native Council of Canada (NCC), which formed in 1970, represented Métis and non-status Indians and pursued changes in government policies with respect to Aboriginal rights, economic development, education, and many other fields. In 1993, the NCC was reorganized and renamed the Congress of Aboriginal Peoples. In 1973, the Supreme Court of Canada ruled on the first land claims case to be advanced by a First Nation in Canada, now referred to as the Calder case. Named after the late Frank Calder, the case was brought forward by the Nisga’a in 1967 to seek recognition of their continuing Aboriginal title. While the Calder decision represented a technical loss legally, it amounted to a significant political victory for all First Nations in Canada seeking comprehensive land claim settlements. Among other things, the Supreme Court decision on the case in 1973 led the federal government to adopt a comprehensive land claims policy that has become a vehicle for the negotiation and implementation of self-government agreements. Between 1978 and 1982, First Nations, Métis and non-status Indian organizations, along with the Inuit Tapirisat of Canada (now Inuit Tapiriit Kanatami), intervened in the patriation of the Canadian Constitution to ensure legal enshrinement of their rights. Since the 1970s, Aboriginal leaders in Canada have also become leading participants in international minority Indigenous peoples' organizations, such as the Inuit Circumpolar Conference (now Inuit Circumpolar Council (Canada)) and the World Council of Indigenous Peoples, which was founded at a conference in Port Alberni, BC, in 1975. The contemporary context for Aboriginal political organization and activism can be defined according to two central themes. The first is the political recognition implied by the federal government’s willingness to negotiate new "modern-day" treaties (comprehensive land claims) with Aboriginal groups that lack pre-existing treaties with Canada. The second incorporates evolving legal realities in Canada that could potentially redefine the relationship between Aboriginal people and the nation-state. These realities were largely sparked by influential Supreme Court decisions such as the Tsilhqot’in v. British Columbia decision concerning Aboriginal title. The recognition of "existing Aboriginal and treaty rights" in Section 35 of the Constitution Act of 1982 set the stage for Aboriginal peoples to define their place within Canada's constitutional democracy. Political advocacy and litigation continue to characterize contemporary political organization. The failed constitutional conferences (the Charlottetown and Meech Lake accords) that followed the patriation of the Constitution have been followed by extensive legal sparring regarding the constitutional right to benefit from lands and resources (e.g., Sparrow, Marshall, and Taku River Tlingit cases). They also resulted in political recognition (e.g., Delgamuukw, and Haida Nation cases) and efforts to establish appropriate political mechanisms for the negotiation of land claim and self-government agreements. Aboriginal political activism since the Second World War has resulted in increasingly greater access to different levels of political decision making, and has greatly changed some aspects of Aboriginal communities. For example, Bill C-31 in 1985 removed the most offensive gender discrimination from the Indian Act. But in doing so, it created new forms of discrimination against Aboriginal women that continue today. As well, Elijah Harper, an Oji-Cree member of the Manitoba Legislature, played a key role in preventing the adoption of the Meech Lake Accord in 1990, which had been created without consultation with Aboriginal peoples. Notwithstanding the election of Aboriginal Members of Parliament, provincial legislatures and territorial councils, Aboriginal activism has mainly been conducted outside the bounds of electoral politics. Reporting in 1996, the Royal Commission on Aboriginal Peoplesmade many recommendations, including calling for major structural changes to the relationship between Aboriginal peoples and the Crown. Specifically, the commission endorsed what has become a major goal of Aboriginal political organizations through making a case for the inherent Aboriginal right to self-government based on historical conditions, the Constitution and international law. 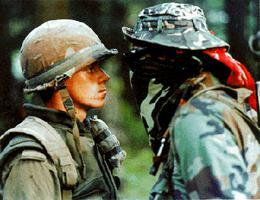 Though the commission failed to achieve all of its goals, its formation following the 1990 confrontation at Oka, Québec, reaffirmed the significance of Aboriginal advocacy and activism. After years of advocacy, then-Prime Minister Paul Martin agreed to host a first ministers meeting on Aboriginal issues in November 2005, in Kelowna, BC. 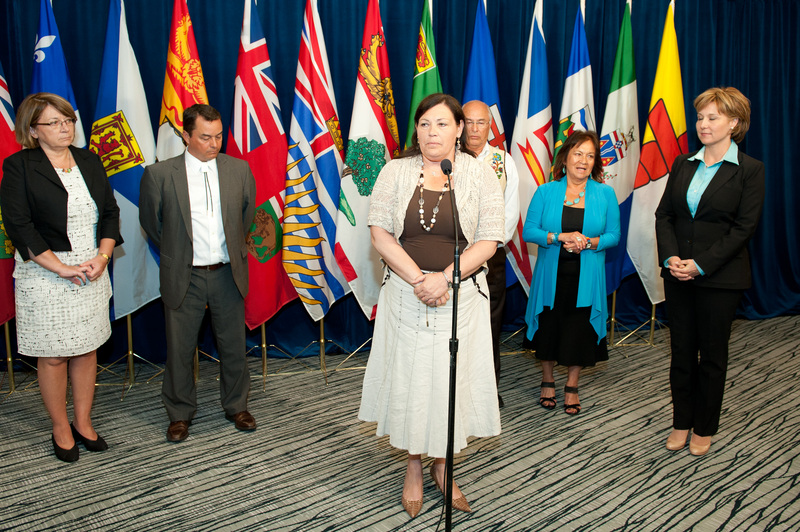 While the potential outcomes of the meeting were unrealized due to a sudden federal election, the meeting was unique in that it brought together a wide range of parties, including all 13 provincial and territorial premiers, the prime minister, and representatives of the five national Aboriginal organizations. 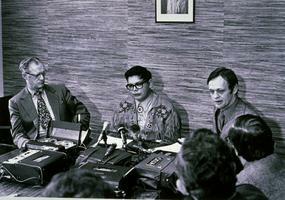 Advocacy for Aboriginal peoples has continued to shape the national political landscape since the White Paper in 1969. The adoption of the United Nations Declaration on the Rights of Indigenous Peoples (UNDRIP) by the United Nations Permanent Forum on Indigenous Issues was at first opposed by Canada in 2007. The UNDRIP represented two decades of work on the part of Indigenous peoples from around the world. While initially supportive of this work, Canada and three other country’s refusal to sign the declaration caused a ripple of unrest. In the House of Commons in 2008, Prime Minister Stephen Harper issued a formal apology from the Canadian Government to former students of Aboriginal residential schools. At that time, many Aboriginal leaders highlighted the obvious inconsistency, given the government's position on the UNDRIP. In 2010, Canada joined the other Anglo-settler countries of Australia, New Zealand, and the United States in endorsing the UNDRIP as an “aspirational” (but seemingly not an actionable) document. Canada was criticized in 2012 by Amnesty International and the United Nations’ Commissioner for Human Rights for continuing to deny that the UNDRIP applies within its boundaries and for failing to respect Aboriginal rights, particularly in regard to resource extraction. On 14 April 2016, the Supreme Court ruled unanimously that the legal definition of “Indian” — as laid out in the Constitution — now includes the Métis and non-status Indians. This ruling will facilitate possible negotiations over traditional land rights, access to education and health programs, and other government services. A younger, mass movement called Idle No More, spurred and sustained by social media, emerged late in 2012. Idle No More’s founders, Nina Wilson, Sheelah Mclean, Sylvia McAdam, and Jessica Gordon, led a teach-in in Saskatchewan to raise awareness and concern about the proposed omnibus Bill C–45, which it was feared would weaken environmental protections, particularly of waterways. A series of teach-ins followed and a national day of action was planned. 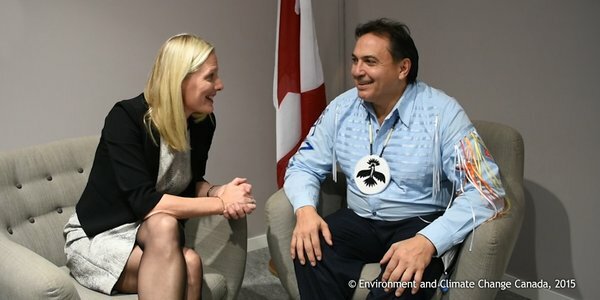 In addition to omnibus Bill C–45, other proposed bills by the Conservative government were criticized by the emerging Idle No More movement as a threat to Aboriginal sovereignty. The 10 December 2012 Idle No More National Day of Action was planned to coincide with the announcement of a hunger strike by Chief Theresa Spence of the Attawapiskat First Nation. Spence’s motivations for her six-week liquids-only fast were to draw attention to the poor living conditions and lack of infrastructure on her reserve — conditions that had prompted the First Nation to declare a state of emergency in the winter of 2011. From a camp on Victoria Island on the Ottawa River near Parliament Hill, Chief Spence also wanted to achieve a meeting with the governor general, Prime Minister Stephen Harper, and Aboriginal leaders to discuss realigning the relationship between First Nations and the federal government. Out of the initial Idle No More teach-ins and Chief Spence’s hunger strike grew a nationwide, mass protest movement characterized by nonviolent cultural expressions such as flash mobs of traditional dances and drum circles, as well as road and railway blockades. The movement’s aims have crystallized around the concept of restoring a nation-to-nation relationship between Aboriginal governments and Canada — a political goal that has increasingly been endorsed in international forums.